Who's on the short list to replace Zinke? 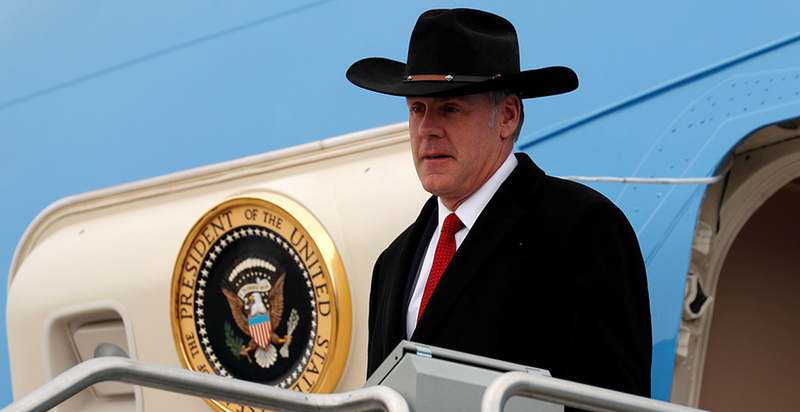 At least half a dozen names are already circulating as President Trump prepares to name a successor for outgoing Interior Secretary Ryan Zinke. One big question: Will Trump opt for a political operator or a skilled lawyer already hard at work behind the scenes? Among the potential candidates is Deputy Secretary David Bernhardt, a former lobbyist who has already faced a Senate confirmation fight. Also in the mix are veteran Republican lawmakers like outgoing Sen. Dean Heller of Nevada and Reps. Cathy McMorris Rodgers of Washington and Raúl Labrador of Idaho. One former senior Interior official said Heller, as well as Rep. Rob Bishop of Utah and Wyoming Gov. Matt Mead, both Republicans, is among the top names circulating for the post. Also reportedly in the mix are Republican Idaho Gov. C.L. "Butch" Otter, Nevada Attorney General Adam Laxalt and Utah Attorney General Sean Reyes (R). Bernhardt, for his part, is seen as an easy pick for Trump. Tapping him to lead the agency's 70,000 employees and $12 billion annual budget would align with his decision to tap EPA deputy Andrew Wheeler to fill in for departing Administrator Scott Pruitt. But some observers say the veteran energy lobbyist may not be the "political leader" Trump is looking for on public lands issues heading into the 2020 elections. One industry source said Heller has been widely discussed as a viable candidate to replace Zinke, mostly because of his proximity to Interior issues and the potential ease with which he could be confirmed in the Senate. Whereas Bernhardt has the support of the Interior staff, the source said Heller could serve as the "vocal mouthpiece" the president is seeking on issues that have political sway. "That's what makes [Bernhardt] more likely to remain a deputy," said the source. Despite a host of environmentalist concerns, Bernhardt was confirmed this summer to serve in the Interior's No. 2 position on a near-party-line 53-43 vote. Before being sworn into office on Aug. 1, 2017, he represented energy and water development companies as the top natural resources lawyer at Brownstein Hyatt Farber Schreck LLP. He has moved between the private and public sectors, previously serving as Interior's solicitor during the George W. Bush administration. Much of the focus will now shift to Bernhardt until a new secretary is named (see related story). Heller recently lost his Senate seat in Nevada to Democratic Rep. Jacky Rosen. He lost in the Silver State in part for his stance on national monuments. While Heller supported Trump's decision last year to dramatically shrink the Bears Ears and Grand Staircase-Escalante national monuments, Rosen ripped the move, saying in a statement that doing so "will put millions of acres of protected lands at risk of mining, drilling, and other harmful activities that will forever alter these outdoor treasures" (Greenwire, Nov. 7). According to an article in The Nevada Independent, Heller is interested in taking the job. The senator's office did not immediately respond to a request for comment. While some observers have pointed to McMorris Rodgers, a well-placed Capitol Hill source said she's not interested in leading Interior (E&E Daily, Dec. 17). This isn't McMorris Rodgers' first time being rumored for a Cabinet position. Last year, she was widely reported as a shoo-in to be Trump's Interior secretary right before the president offered the job to Zinke. Possible reasons she lost Trump's favor are political baggage that could have complicated a confirmation hearing and her views on selling off public lands (Greenwire, Dec. 14, 2016). Labrador may be a leading candidate, after the Associated Press reported that he met with White House officials on Saturday. Labrador was a finalist for the post the last time around, making a high-profile trip to Trump Tower in New York in December 2016 to interview for the job. Labrador needs a new job now, too, after deciding to leave Congress at the end of the year. He wanted to become Idaho's governor but fell to defeat in the state's primary this year. He's the co-founder of the conservative House Freedom Caucus. Sandoval could not run for re-election because of term limits. Politico named him as a possible replacement, but he could face an uphill battle after parting ways with Trump on some key issues. In April, Sandoval opposed the president's plans to send National Guard troops to the Mexico border. He also criticized the president's budget for including funding for Yucca Mountain as a nuclear waste facility. Denham, a fourth-term congressman from California's Central Valley, is leaving Congress after getting defeated last month. Representing a district that includes much of the San Joaquin Valley, he this year opposed Trump's plan to do away with the Affordable Care Act. Bishop, an eighth-term congressman, is the chairman of the House Natural Resources Committee but is set to leave the post when Democrats take control of the House next month. He has been one of Zinke's most ardent supporters on Capitol Hill. On Saturday, he said Zinke "had a vision of a better future — an efficient department, a park system without a backlog, a staff who listened." Some speculate that Trump could go with a Western leader with a good record of working with Democrats, such as Mead, who is term-limited and will leave office next month. "With Matt Mead, you get kind of a unifier," said John Swartout, a Republican serving as senior policy adviser for Colorado Gov. John Hickenlooper (D). Mead is seen as environmentally friendly, for the most part, after championing strong protections for the greater sage grouse. Mead stood next to former Interior Secretary Sally Jewell three years ago when she announced finalization of federal grouse protection plans that the Trump administration is now working to revise. "Matt Mead works with my boss; he works with [Democratic] Gov. Kate Brown in Oregon," Swartout said. "Other Democrats respect Gov. Mead a lot." Reporters Scott Streater and George Cahlink contributed.